At the Austin dental office of Candace Bruno, DMD, we are dedicated to partnering with our patients to create personalized treatment plans that allow them to achieve and maintain their healthiest smiles as well as improving whole body health. Every treatment plan takes into account how your entire smile and whole body will be affected. This treatment philosophy is referred to as holistic dentistry. If you want to learn more about Austin holistic dentistry, call to schedule your appointment with Dr. Bruno and her dedicated dental care team today. Holistic dentistry isn’t one dental service. It’s an entire treatment philosophy. Rather than looking at one problem, like a cavity, and fixing just that problem, holistic dentistry considers the underlying reasons for the cavity and strives to address the root of the problem. For instance, a patient with a cavity may actually have thinner tooth enamel, inadequate at-home hygiene, or an overly sugary diet that all contributed to this one dental problem. 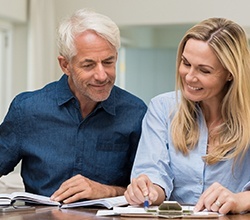 When you take the time to determine the underlying causes of specific dental health concerns, you and Dr. Bruno are better equipped to prevent them from recurring. The field of dentistry has made a major shift in the last several decades from focusing on reacting to tooth decay or damage to a focus on preventing oral health concerns before they begin. Holistic dentistry is the obvious next step. By taking a holistic approach to your dental health, Dr. Bruno and her Austin dentistry team are better able to prevent common oral health issues like tooth decay, gum disease, teeth grinding and clenching (bruxism), and temporomandibular joint (TMJ) dysfunction. In addition to improving your oral health, holistic dentistry also improves your whole body health. 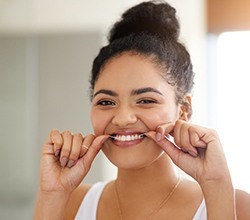 Because many of the underlying causes of oral health issues can also affect the whole body, when you make changes to your diet, hygiene routine, and health habits to improve your smile, you’re simultaneously improving overall health. 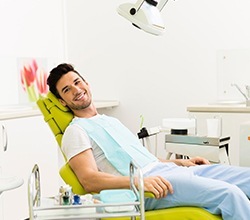 To better understand holistic dentistry, you may want to consider how it effects individual treatment plans rather than just looking at how the philosophy applies to the dental field as a whole. One example of how holistic dentistry can improve your smile and your overall health is in treating unconscious teeth grinding and clenching referred to clinically as bruxism. This common oral health concern effects numerous patients of all ages, and in the past, it was rarely treated at all. Today, patients who struggle with bruxism will typically receive mouthguards to wear during sleep. This is an improvement over foregoing treatment altogether, but holistic dentistry digs deeper to find the root of the problem. Many patients with bruxism have a misaligned bite that leads them to constantly move teeth around looking for the best resting position or apply excessive pressure to over compensate for the misalignment. Others, struggle to properly cope with stress and anxiety, which then leads them to grind or clench their teeth. Still others experienced incorrect dental development due to tongue thrust, continuing thumb sucking and other habits into advanced age, or damage to the jaw during dental development. Each of these potential causes of bruxism is very different, but all of these patients would receive the same treatment from a traditional dental care provider. A holistic dentist will help patients determine the underlying cause and address this issue.